The J. T. Hood Elementary School and L.D. Batchelder Elementary School were two of only four schools in Massachusetts with more than 90 percent of its students scoring “Advanced” or “Proficient” on the most recent statewide science standards-based assessment. This is nearly double the state average, with just 48 percent of students across Massachusetts scoring proficient or greater. J.T. Hood is also tied for No. 3 for students scoring proficient or greater, at 91 percent. L. D. Batchelder Elementary School is tied for No. 2 for Grade 5 students scoring “Advanced,” and No. 2 in the state for students scoring proficient or greater. North Reading Public Schools has been using KnowAtom’s comprehensive, grade-specific science curriculum designed for the new Massachusetts science standards since 2010. 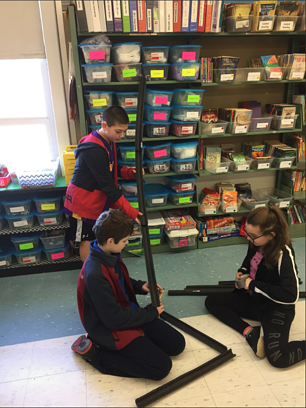 The core of KnowAtom’s next generation inquiry process is students investigating phenomena and designing solutions to problems hands-on. This approach ensures that all students are engaged every day as scientists and engineers in the classroom. Whitney Cleary, the fifth-grade science teacher at J. T. Hood, has been teaching using the KnowAtom curriculum for nine years and credits her school’s focus on making science a core subject, equal to ELA and math, for the gains in scoring and students’ overall enthusiasm for science learning. KnowAtom makes real science possible in every K-8 classroom. We provide a complete K-8 solution designed for mastery of the Next Generation Science Standards: fully aligned curriculum, integrated hands-on materials and targeted professional development. Our research-based, classroom-tested tools and techniques bring students’ own ideas to life with hands-on materials and technology.